Description: This is the only northern European species with a characteristic striped appearance, and especially the female can not be confused with any other species.Female abdomen blackish with light edges and two light brown bands running back from the posterior eyes. Abdomen light grey with two distinct longitudinal brown bands becoming narrower at posterior end. 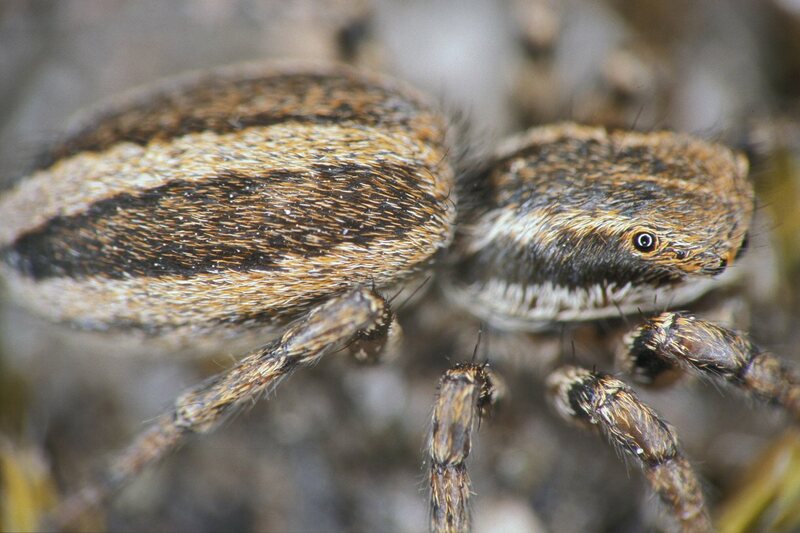 Legs ringed in yellow-brown and dark-brown, the rings somewhat obscured by light-grey and brown hairs. 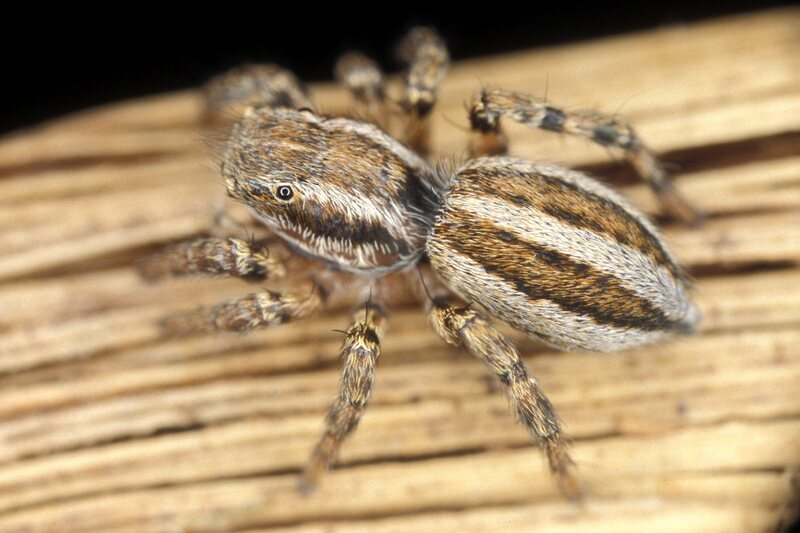 The male has the same striped abdominal pattern as the female, but is so dark that the stripes are difficult to recognize. 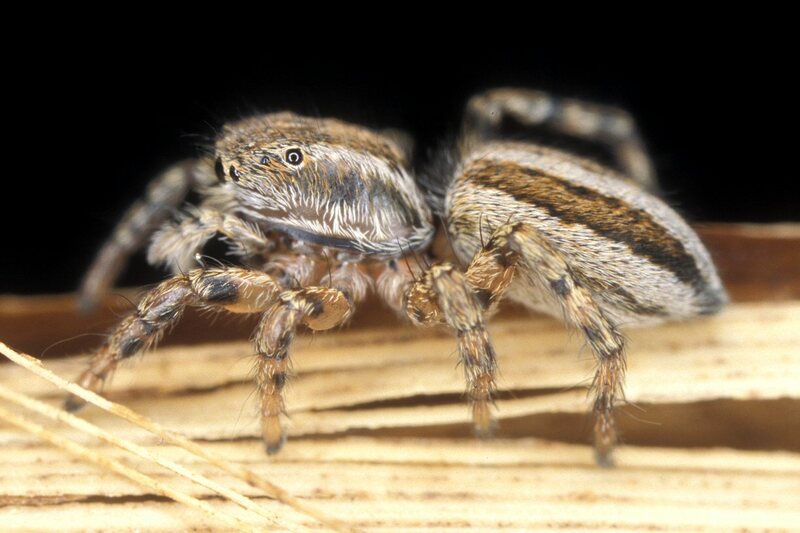 Abdomen, legs and palps sparsely covered with small, yellow hairs. Legs and palps uniform dark red-brown to black. Anterior eyes with narrow rings of white hairs. Size: Female 6-7 mm; male 5-6 mm. Genus: Phlegra Simon, 1876. Characters of genus: The genus is characterized by ocular trapezium nearly twice as broad as long, by tarsi I and II having scopulae and by legs IV shorter than legs III. One species occur in North Europe, including Denmark, with one further species in Central Europe.